This beautifully styled unit features a large 23-5/8"W x 19-7/8"D reading surface, a pencil tray and cushioned wrist support/paper stop. Side shelf pulls out on left or right to hold equipment or notes. 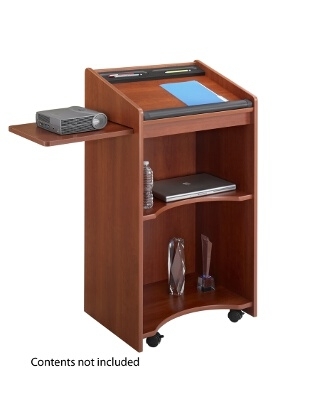 Two curved interior shelves hold equipment while allowing the speaker to stand close to the lectern. Fixed lower interior shelf; upper shelf is adjustable. Mobile on four swivel casters (2 locking). Quality 3/4" furniture grade wood construction with rich laminate finish in Cherry. Easy assembly with cam-lock fasteners.